The 5th edition of ManilART, one of the largest art festivals in the Philippines, will be held at a brand-new location, the SMX Aura Convention Center in Taguig City on October 9-13. The venue is the newest in the country, flocked by the most prestigious commercial and business developments in Taguig's Bonifacio Global City. This marks the official opening of the art fair, strictly by-invitation-only. Top attaches and cultural ambassadors, and the most prominent major movers and shakers in the Philippine art scene will grace the event. A series of art lectures and seminars covering various topics will be held at each day of ManilART. The discussions range from general art-appreciation topics for students and novices to expert, in-depth forums on the art local and international industries, including conservation and copyright issues. The auction will be conducted by a professional auctioneer, featuring 40 outstanding works by Filipino contemporary artists. 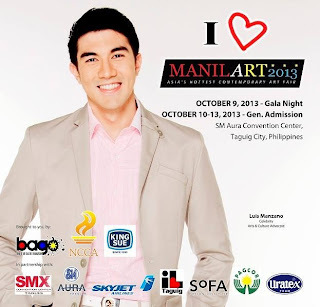 ManilART 2013 is at once the venue to support new talent, celebrate icons, and advance art appreciation into the cultural mainstream. Organized by the Bonafide Art Galleries Organization (BAGO) and supported by the National Commission for Culture and the Arts (NCCA), ManilART 2013 will showcase Philippine contemporary art through exhibitions of the country's finest galleries, as well as forums, workshops, and various activities for aficionados, artists, collectors, and investors.